One of our best selling products ! 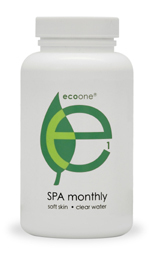 EcoOne Monthly is a powerful, monthly formula using natural compounds and organic enzymes to gently keep your spa crystal clear while leaving your skin feeling smooth and moisturized. You hardly ever have to add any other chemicals to the spa. Eco-friendly and totally non-toxic. Keeps you spa water much clearer and fresher smelling than bromine or chlorine. Safe for all skin types. No irritation. Helps keep PH in balance too. Say goodbye to adding numerous chemicals to your spa water daily or weekly. Eco One does it all in a convenient once-a-month dose. If you are using Eco One for the first time, we highly recommend that you order the EcoOne Starter Kit instead. Try EcoOne....you'll love it ! foam reducers, pH up, pH down, clarifiers, scum digesters, filter cleaning products, chlorine/bromine, etc. New Eco One Spa Treatment solves most water chemistry problems ! Spa water chemistry problems continue to plague many hot tub spa owners. In fact, many people indicate that they do not use their spa as much as they want due to poor water quality. That is a real shame...to let that big beautiful spa go to waste ! Luckily, there is now an answer to most spa water chemistry problems. That answer seems to be this EcoOne stuff ! This enzyme based water conditioner is produced by a company called Pacific Sands in California and it is quickly turning out to be one of our best selling spa products ! Pacific Sands is, at its core, an environmental company. The goal of the company is to develop and market water treatment solutions that do not incorporate toxic substances. In fact, all the ingredients in Eco One are 100% safe and natural. Pacific Sands actually develops aqua-environmental solutions for industrial, agricultural and consumer products. These products are nontoxic, enzyme-based water treatments that have applications ranging from cleaning products and pet care to water towers, factory holding ponds and even wastewater treatment ! This advanced technology is now available to consumers for use in home hot tub spas ! We at Poolandspa.com have tested this product extensively and it appears as if EcoOne Monthly may turn out to be one of the finest, easiest to use and safest spa water conditioners on the market today. Your Spa water will be softer, clearer, with no odors, no foam, and no irritation to the eyes or skin. Eco One is a unique formulation of Natural enzymes, minerals, and plant extracts that contains no chlorine, bromine or other harsh chemicals. Eco One can act as a replacement for, or greatly reduce your need for the vast majority of your spa-care chemical regime. One bottle of Eco One monthly in conjunction with non-chlorine shock will effectively keep your spa water crystal clear and odor free for 1 month. The biggest advantages of this product over chlorine or bromine is that you will have no more chemical odor, your water will remain “new” looking and feeling for 1 month, you will have no more itching, no more rashes, no more scum lines or “ring around the spa”. It will reduce or eliminate spa foam and also helps maintain a balanced pH and alkalinity. And your water will truly sparkle. It’s a miracle ! We suggest that you give it a try. You have nothing to lose and a sparkling clear hot tub spa to gain ! Please note: If you have well water or your city water supply is known to have hard water (minerals in the water). We suggest using a Demineralizer such as Leisure Time Spa Metal Gone after a refill and BEFORE you add shock to the water. Failure to do so may result in the water turning a reddish/brown color and you will have to drain the tub and start all over. If you are unsure if your water is hard, then we suggest using the Demineralizer just in case. If you are using Eco One for the first time, we highly recommend that you order the EcoOne Starter Kit instead. EcoOne - It’s a miracle!